YAHOO!! LITHOGRAPHY IS DONE!!!! FINALLY!!!! This exceedingly lengthy stage in the creation of our tome is now complete following six months of effort by Friesens’ staff and ourselves. Yesterday I flew home to my Pat, well satisfied that LABYRINTH SUBLIME is ready for shipment to Ontario. The wonderful people at Georgetown Terminal Warehouse are alert to receive our project and soon binding can commence at Felton Bookbinding. I’ll share much more about GTW and Felton in subsequent emails. This past week has been quite a push with very long days of steady concentration to marry the inspected thirds (the first 120 pages, the middle 120, and the final 120) while reviewing the reprinted pages to replace those from the initial printing which were problematic. 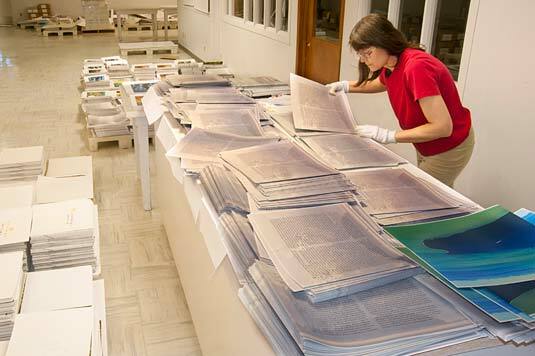 My inspection was also a final check for missing or duplicate pages and collation order. To accomplish this, I prepared a check list, which I studiously followed. Each book block (unbound set of pages) had its own check list, which I numbered, dated, and signed when my checks for that particular book block were complete. The book block, accompanied by this autographed check list, was thus officially approved by me and authorized to be packaged for shipment. Among my checks was to colour match the right and left halves of a two-page image of mountains, island and sea over which text is imposed (pages 14-15). Despite that the two halves of this pastel image were printed on separate sheets months apart, I was able to get exact colour matches for all copies of LABYRINTH SUBLIME. To accomplish this, we used a lot of paper during the reprint of page 15 (in fact five times what would normally be used) and we intentionally created slight colour variations. This particular image is one of shades of grey and blue. Just 1% extra yellow can turn the foreground island from purple-mauve to warm grey; 1% extra magenta can change the distant mountain slopes from plum to rose. Where the halves meet, in the gutter, differences would be unacceptable for a volume such as ours. I spread the variations across my work station (as you see in the photo above) and on pallets nearby. At times, I could exactly match the upper two-thirds of the cross-over image, but not the lower third. Eventually I was successful at matching pairs so closely that you’d think they were printed together on one sheet. Part of my difficulty had origins back at the paper mill. Curwin Friesen, president of Friesens Corporation, explained that when inspected at such a critical level, I must recognize the reality that paper itself absorbs and reflects colour uniquely. The enamel-like surface of the paper is composed of clay mixed with titanium. Minute differences in the ratio and/or thickness of these materials, together with variations in the calendaring (the polishing) of the paper surface during paper production, will result in variations in how the ink is received and sets-up — thus subtile variations in colour. The colour matches for LABYRINTH SUBLIME’s eleven double-page cross-overs are exact! We’re quite proud of this. With great effort, the inspection of the book blocks progressed. I’ve just made a calculation of weight and have to say “Good Gracious!” At 19 pounds per book block (with the protective hard board top and bottom) times 300 copies, that’s nearly 3 tons of finished printed papers that I handled several times this past week alone! Here I am with 15 approved book blocks. Friesens’ employees Chris Wolfe and Erin Loewen carefully place the approved book blocks (with the corresponding signed-and-numbered authorization form) on the deck of the shrink-wrap machine. Michael Funk stationed at the rear of the same machine receives a few shrink-wrapped book blocks, and shuts off the machine. This was a slow, meticulous, start-stop effort. 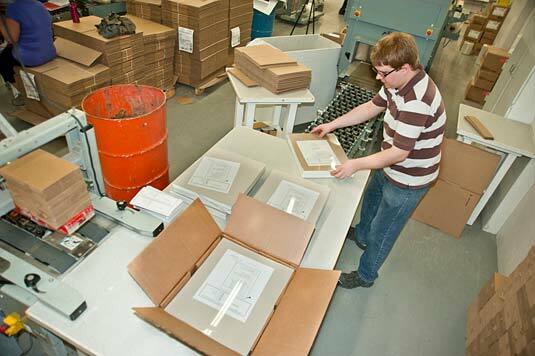 Michael builds the cardboard boxes; places two book blocks in each box; and pads the edges and top. The box is then sealed. Chris was responsible for labelling the boxes with the edition numbers of the two book blocks within. Michael, Erin and Chris spent a full day and Chris a further part day involved with the packaging of LABYRINTH SUBLIME. Chris places the boxes of LABYRINTH SUBLIME on pallets. In the shipping department these boxes will be further protected by corner boards, side boards, topped with a wooden skid, and shrink wrapped for stability. A few Friesens employees commented that what to their eyes is a very small press run (300 books) was worth more than their houses. This is true, just considering the printing bill alone. Saturday 5:15 p.m., my inspections completed and the majority of the book blocks packaged, I yelled aloud —YAHOO!! LITHOGRAPHY IS DONE!!!! FINALLY!!!! Can you believe, all the photos you’ve seen with me in them, are ones that I’ve set up on the self-timer function on my camera. It’s been fun and it’s been possible because of digital technology. I take images, camera on tripod, review the shots instantly, adjust settings or composition (including where I might chose to stand... or jump as the case may be), and then take and review more photos until I’m satisfied. To the talented craftsmen, operators, and management at Friesens, our thanks for working with us at this high level of perfection with good humour and innovation reaching well beyond the normal production standards. To all the staff thank you for welcoming us as your Artists in Residence for such a long, intense period. Together we have created a true masterpiece. Greatly appreciated has been the warmth of individuals, along with thoughtful gifts such as Tracy Nobel and Jill Friesen’s home-baking; Dr Ed’s lilac sprigs presented as aroma therapy to help keep me focussed; Doug and Deb Symingon’s home-canned tomato juice made from tomatoes from their own garden; Jef and Shauna Burnard’s care packages of wine and cheese, music and Ansel Adams’ photography; the lunch room ladies’ kindness to set aside for me the last vegetable cup or bowl of soup; Mark Friesens’ cheerful morning greetings and evening goodbyes; John Wall’s discussions on many topics and his wistful poetry; David and Evelyn Friesens’ hospitality in sharing their condo these past months; Dan Klassen’s cheerful “Hello Sunshine”; Lydia Baier’s hugs, night-shift coffee breaks and lending a sympathetic ear whenever I was frustrated (all communicated in German). Thank you to the many Friesens’ people who have been involved in one way or another with this phase of our project, several of whom asked with sincerity upon hearing that I was headed home, “Oh, for how long?” Indeed it is lovely to be so welcomed. More missives to come as we introduce you to the skilled master binders at Felton Bookbinding.